Eat less meat, but better meat. Americans eat a lot of meat, including chicken, beef and pork. And the rest of the world is starting to follow in our footsteps. According to the US Department of Agriculture, Americans ate a record amount of meat and poultry last year — 222.2 pounds of it per person, on average, placing Americans at or near the top of per capita global levels. But there’s a growing number of people who are interested in eating less meat. Industrially producing meat takes a huge toll on the environment, using enormous amounts of resources like land, crops, water, energy while producing a colossal amount of carbon dioxide-equivalent gases. It’s also terrible for animals, and devastating for people who live and work in the communities around the factory farms. One way we can decrease our foodprint — the impact of our food production on the environment, animals and people — is to eat pasture-raised, rather than factory farm-raised, animal products and to eat much less of them. We call this approach the “less meat, better meat” strategy. Before we talk about the amount of meat you’re eating, we need to talk about how the meat was produced. There is a big difference between pasture-raised meat and industrially produced meat. Pasture-raised animals spend their time eating vegetation, unconfined and able to express their natural behaviors. Animals raised in an industrial system, in “CAFOs,” are kept in barns, cages and lots, and fed a grain-based “feed.” These confined systems are often inhumane and have disastrous effects on soil, water and climate. Farmers who produce pasture-raised meat can use field, livestock and waste management techniques that reduce the emissions that come from animals’ manure. 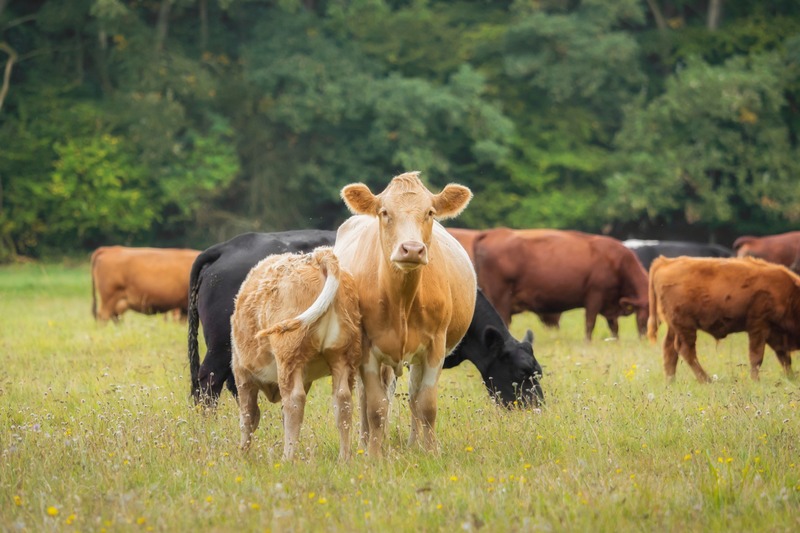 In fact, it’s even possible for well-pastured beef to “sequester” a significant proportion of carbon produced on the farm (hold it in the soil), making a negative carbon benefit possible. Plus, pasture-raised meat isn’t just better for the environment, it’s better for animals and better for eaters, too. So to start this project right — eating less meat, that is — pay attention first to what meat you’re buying. You can find information about various meat labels in our Food Label Guide, and read more about the process and the benefits of pasture-raised meat here. Pastured-raised animal products are often more expensive than the conventional, industrial meat sold in most grocery stores, but consumers can use the money saved from buying less meat to purchase better meat (and more produce, legumes, etc.). And while it doesn’t change your weekly grocery bill, it is also worth remembering that paying more for pasture-raised meats means paying for the food’s “true cost,” including environmental and health benefits. If you cannot afford to buy or cannot locate better, pastured meat, you can focus your efforts solely on eating less meat. You have some sustainably raised meat in hand, two slices of really good bacon, perhaps. Now you’re going to use it thoughtfully. Here are some ideas for using meat for its flavor instead of for filling you up. Two strips of bacon, or two chicken thighs or a small ham hock, say, could flavor a meal for your whole family. Ham hocks or bacon to flavor soups, stews, beans and more. Bits of bacon or sausage to flavor your favorite pasta dishes. Small chunks of chicken or sausage on a salad. Blended Bolognese or blended burgers (part beef, part mushroom). Any one of these 16 Not-Quite-Meatless Recipes from Mark Bittman. Stretch a small piece of meat by using it in veggie-powered tacos or as vegetable-laden pizza topping or as chunks on a kebab. But everyone knows it’s all about the sides, so why not make the sides the center? Or go ALL sides and have them be greens flavored with meat. Or green beans in pork stock (h/t Edna Lewis for both of these). If you’re worried about the health ramifications of shrinking that portion of meat, keep in mind: you really do not need to be eating so much meat. Many people are worried about getting enough protein, likely because food marketers have been pushing protein on us for a few years now, adding it to bars, shakes, cereal and more. Many people are eating about 100 grams a day, which is about double the daily recommendation of 46 grams for women and 56 grams for men.